As 2017 comes to an end, I am reflecting on our community of alumni and how far we have come in the last few years. We have finished three consecutive years with a balanced budget, increased fundraising $100,000, grown the portfolio to $10.5 M, and decreased the draw on our portfolio to 5.2%. But most importantly, alumni are as engaged as ever and excited about Camp Rising Sun! Throughout the year, much of my time is dedicated to meeting with alumni in different regions. Besides the time spent at Camp itself, these meetings are the most gratifying - and interesting part of my job! As the year comes to an end, we are offered a look back at all the wonderful things that the year brought with it. In January, we honored former LAJF executive director and Nobel Peace Prize Nominee, David Ives (‘99-’00), with Emeritus Board membership. We welcomed alumni for our annual NYC reunion (in 2018 it will be on April 14). Despite the record snowstorm, alumni joined us from New Mexico, California, Minnesota - even as far as Australia! Early March in Rhinebeck provided us just the right temperature to make our Camp Rising Sun maple syrup. 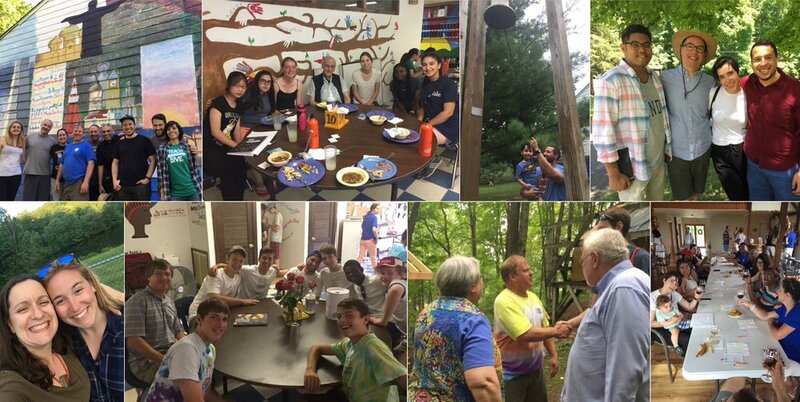 An alumna from New York who had not visited Camp in 19 years joined us with her whole family. Later in the month, I visited with many alumni in Washington, DC, spanning five decades of Camp years, including some of my own campmates who I had not seen in a long time. By May, we were putting up the tents and preparing Camp for the summer. An alumna and her family joined us from London! And another alumnus drove all the way from Canada. Throughout the season, we had visits from Steve and Meghan Domine (‘79, ‘12), Rick Richter (‘50), David Ives (‘99), Anam Mehta (‘12), Mert Sola (‘07), Johnny Ross (‘10), Elyem Chej (‘09), Ritam Mehta (‘11), Lara Fjelsted Asgeirsdottir (‘09), Camay Barrett (‘05) , and many others! The summer alumni reunion (in 2018 it will be from July 20th to 22nd) was sold out and we welcomed alumni and their families from as early as the 1950’s. The weekend was full of activities and an incredibly fun and fulfilling way to reconnect with Camp. In the fall, I visited Boston, Philadelphia, San Francisco, and Los Angeles. I shared meals, stories and laughs with dozens of alumni and met such interesting people. Some of these alumni have kept in close contact with CRS, however, the majority of those who I met with have not. “I just didn’t know how to get re-connected” or, “I think about my Camp experience often, but just didn’t think to get involved” are common sentiments I hear. I also deeply enjoyed our annual Women’s Brunch which featured an inspirational talk by Karen Schatzel to our alumnae. Meeting one-on-one with alumni is so gratifying for me and serves as a good way to get folks back engaged. An alumnus from 1964 had not been in touch for most of his adult life. He shared how Freddy visited his school and explained what activities were available at Camp and that if he didn’t want to do those, he could just lay on his back and look at the clouds. I feel so incredibly lucky to be part of our Rising Sun community and that it is my job to meet such interesting people from around the world. On behalf of the team at LAJF, I wish you a peaceful holiday season and a happy new year. Cheers to a wonderful 2018 Camp season!